I certainly wasn’t expecting the first aviation outing of 2019 to feature one of the rarest airworthy jets in the world. 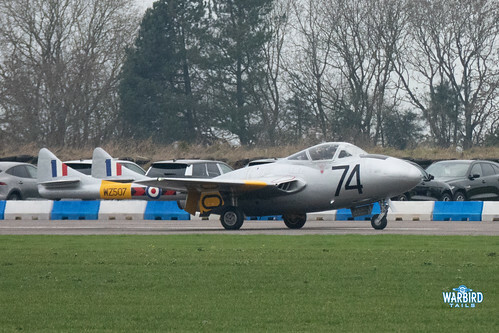 While the sight of a flying Gloster Meteor in the traditionally quiet early January was a welcome treat, it was most definitely bittersweet in that it would mark the final touchdown of a UK airshow regular. The delivery flight of this night fighter variant of the Meteor marks another departure from the long-term Air Atlantique Classic Flight collection, based at Coventry for a number of years. This airframe, together with the other classic jets in the collection were once regulars at events up and down the country. As time went on classic jets seemed to become less popular and this airframe, together with the flight’s other Meteor (T7 WA591) were put up for sale in 2015 and failed to attract a buyer for a number of years. After years on the market a buyer was found late in 2017 when it was announced that WA591 would be moving to the United States to be operated by the World Heritage Air Museum, an organisation that operates a number of other classic jet designs. Following a number of test flights and conversion training for new owner Marty Tibbits, the T7 was flown to Liverpool before being dismantled and shipped to American. The NF11 was also sold at this point, eventually destined for America as well (as far as I am aware). Tragically, while piloting a de Havilland Venom alongside the Meteor on the way to the Gloster’s debut airshow performance at Oshkosh, Marty was killed in an accident. The Meteor went on to fly as part of the Oshkosh show, making its show debut, which no doubt would have been what Marty would have wanted. 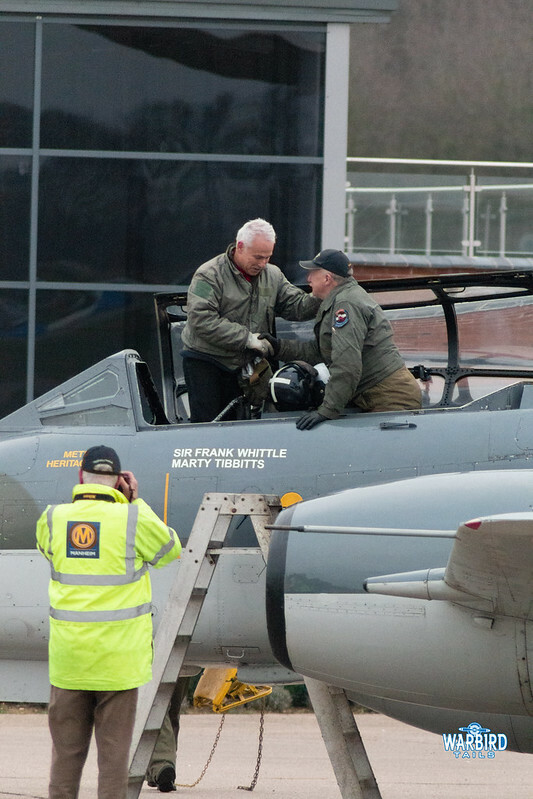 It is fitting that G-LOSM now bears Marty’s name below the cockpit, alongside Sir Frank Whittle’s, whose ashes the airframe carried in 1996. Both touching tributes to the man who saw the birth of British jet aviation and someone who went to great lengths to keep these machines in the air after they had been rested so long. 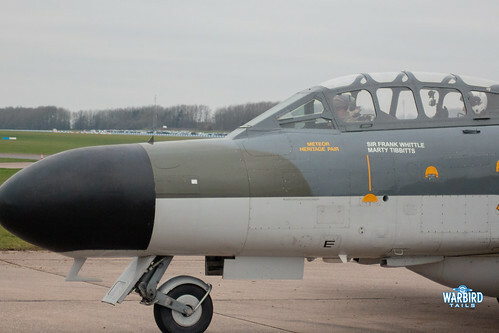 It was announced late in 2018 that the other Meteor, NF11 WM167, still at Coventry had been sold and would likely be moving to Bruntingthorpe to join the other classic jets in fast taxi demonstrations. This move was later confirmed and it was announced that WM197, together with Venom G-GONE, another longtime performer, would be joining the Classic British Jets Collection. 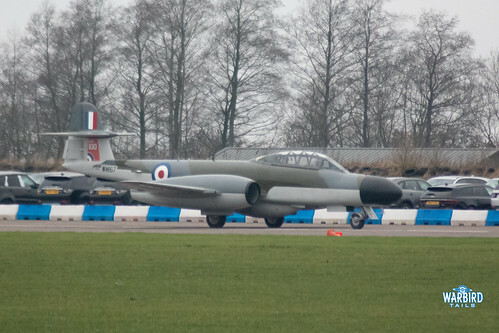 After a rumoured ferry flight late in 2018, things went quiet on the Meteor front until, seemingly out of the blue, a final flight event at Bruntingthorpe was announced. The chance to not only enjoy a rare visit to Bruntingthorpe (my first in 10 years) and to see a UK based Meteor fly for likely the last time (aside from the Martin Baker pair) was too good a chance to turn down. 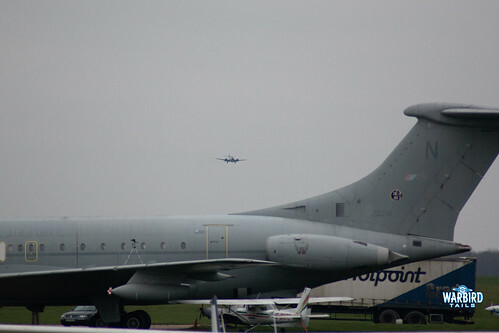 Arriving at Bruntingthorpe there was certainly no doubt that it was going to be a very, very cold day. An enclosure had been put aside close to the taxiway with a view across the runway. It was clearly a challenge to fit the event in amongst other airfield events and I must thank the team for opening such an event to the public on short notice. As with all things aviation, particularly one-off ferry flights, timings were always going to be “fluid”. It was about three hours after arrival before the Meteor was noted as airborne out of Coventry. 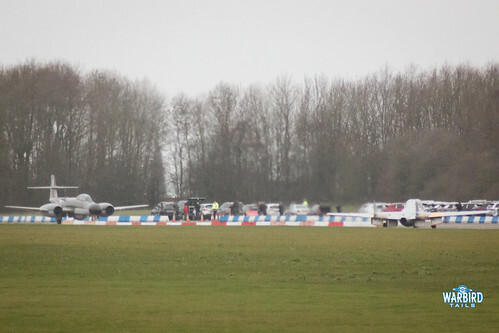 Aside from the bitterly cold conditions the wait was quite enjoyable, with the opportunity to admire (from a distance) some of the taxiing classic jets and a welcome selection of classic aircraft moving in and out of the airfield. 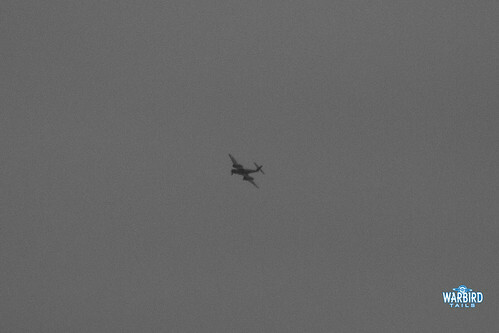 Jet Provost G-PROV also put in a welcome appearance arriving ahead of the Meteor and going up for a short local flight before the arrival. It had been heavily hinted that the Meteor wouldn’t be alone on its arrival and sure enough, Coventry based Vampire WZ507 was airborne at the same time. 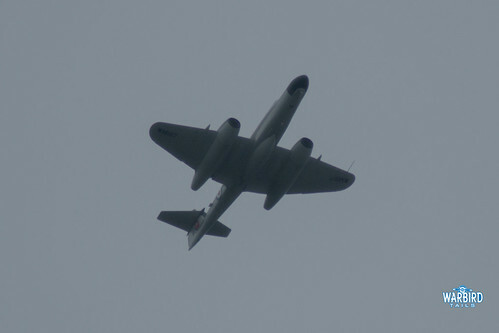 Dan Griffith, the main Meteor display pilot in the UK civilian scene and one of the only pilots to display this example had the honours of the final flight. After a short transit the familiar silhouette of this unique machine honed into view before making a sedate pass above the airfield. The Meteor then performed three missed approaches, each with that distinctive steep climb out that is so unique to the Meteor, you could be forgiven for thinking that neither the pilot nor the aircraft quite wanted to call time! This arrival sequence was interspersed with surreal sightings of the Vampire appearing as it flew around the local area in the hold. As the Meteor broke into the circuit one last time the Vampire joined downwind and landed (I’m not sure when the last time a Vampire landed there?) before the Meteor finally made contact with the runway it will now call home. 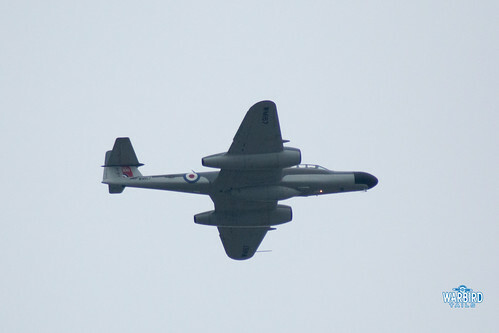 A fitting conclusion to a bittersweet, last minute event was, in an era where classic jets are disappearing at an alarming rate, was the sight of a Meteor leading in a Vampire and Jet Provost before parking up for one final time. After shutdown Dan Griffith and his passenger, the new owner Dave Thomas stood up in the cockpit and shook hands to mark the handover of this unique machine. It was great to be there for the final flight of this great machine but I can’t help thinking that it is a shame that we will no longer see this classic shape in the sky. This certainly is another reminder if ever one was needed, to not take anything for granted in this scene. This machine was such a regular for so many years that I think it may have been taken for granted. It is a great result that the airframe will at least stay active and be available for the public to enjoy in the future. 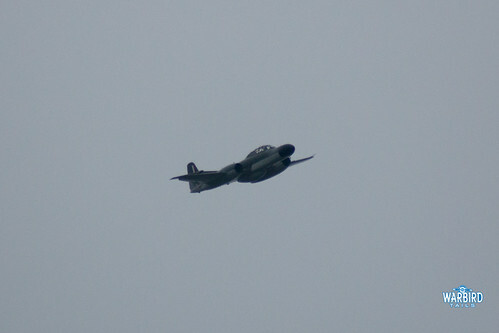 I look forward to seeing the Meteor again later in the year at the Sea Vixen event in April. Great write-up and wonderful photos of this iconic aircraft. Thank you. Thanks for the write-up. Hopefully not too many years before we see the NZ NF.11 airborne.